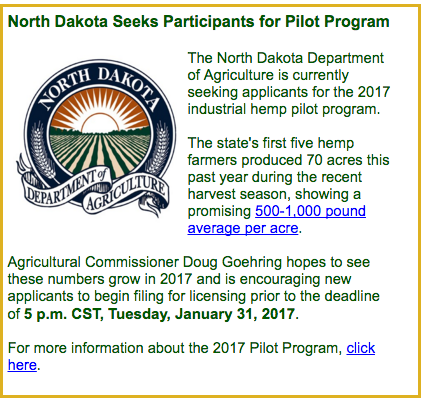 North Dakota Department of Agriculture seeking participants for the 2017 Industrial Hemp Pilot Program. BISMARCK – Participants are being sought for the second year of North Dakota Department of Agriculture’s industrial hemp pilot program. A provision in the 2014 farm bill gives authority to state departments of agriculture to cultivate industrial hemp for research purposes. Participants planted 70 acres of hemp in 2016, the first year of the program. Applicants must submit a project proposal application and request for seed (if applicable). Proposals will be ranked by a committee appointed by the agriculture commissioner. Applicants chosen will be required to submit a notarized application, signed memorandum of understanding, fingerprints and associated fees. Applications and instructions can be found at http://www.nd.gov/ndda/program/industrial-hemp. The deadline for proposal documents is 5 p.m. CST, Tuesday, January 31, 2017. Emailed or faxed submissions will not be accepted. Research proposals will be date stamped when received. All received research proposals will remain unopened until February 1, at which point all proposals will be opened and reviewed. Goehring said applicants needing more information should contact the Department of Agriculture’s Rachel Seifert-Spilde at 701-328-4128 or rseifert@nd.gov.